If content marketing were a high school, video would be sitting at the cool kids’ table. Data from Wyzowl’s The State of Video Marketing 2017 report showed a majority of businesses are now using video as a marketing tool. Ninety-nine percent of this group will continue to use video throughout 2017. And 82 percent will spend more on video during the year. Long story short, video marketing is being fitted for a letterman’s jacket and is in the running for prom king. But why? The simple answer is it works. Improved user understanding of their products and services. Boosted traffic to their websites. Reduced the number of support calls they receive. That said, video comes in many shapes and sizes, from animated explainers to onsite corporate promos to video blogs. It’s that last example that many businesses may find as their ideal starting point for a video marketing strategy. Blogs are the bread and butter of content marketing, offering businesses a chance to enhance search engine optimization while generating awareness and building trust among prospective customers. Video blogs represent the next step. It may be helpful to clarify exactly what we mean by the term “video blog.” Allow Brafton Project Manager Eric Rubino to enlighten you. 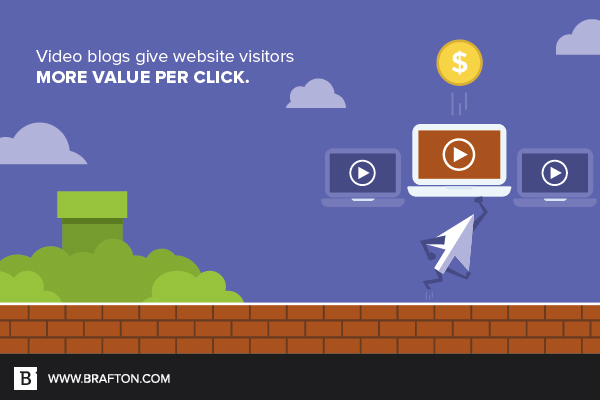 More important than what video blogs are, however, is their benefits. Videos also lend themselves to conversions. Not sure where to start with your own video blogs? With so many options, there’s rarely a wrong answer. Let’s start with standard blog posts. Incorporating video blogs into articles is easy and effective. A minute-long video in the middle of your copy can expand on a specific point or term, offering an easy way for consumers to learn more. Better still, it affords marketers the chance to avoid writing long, drawn-out explanations that may turn off readers who are already familiar with your industry. Finally, it helps visually break up your content, creating a more aesthetically pleasing web page. Many businesses opt for video blogs to be the star of the show, with a minimum of copy sits below the video player for SEO purposes. These are especially ideal for business-to-consumer companies hoping to provide quick, digestible content for readers on the go. Another option is making video the bookend of an email drip campaign. Say you’re planning to send out a series of emails to explain a complicated topic. You can use video to introduce the campaign in your day-one email, as well as close out the campaign with a video summarizing the information you’ve shared and encouraging recipients to request more information about your product or service. Other options include inserting videos into landing pages to help explain your value proposition, or sharing them on social media to generate interest and lead traffic back to your website. What all these options have in common is a low barrier to entry in terms of cost. Some businesses avoid video marketing due to misconceptions regarding price. Marketers assume paying for equipment, videographers, actors, sets and editing will break their bank. Luckily, this doesn’t have to be the case. While video blogs can be used for pretty much any purpose, it does pay to consider if it’s the right format for what you’re trying to accomplish. It’s also important to remember that certain situations may call for a different video format. The power and popularity of video is only continuing to grow. If it’s not part of your current content marketing strategy, now is the time to make a change, and video blogs are the perfect place to start. Eric Wendt is a writer and editor at Brafton. He discovered his love of words after realizing he was terrible at math. If he's not updating his Tumblr with poetry he's too embarrassed to share, there's a good chance he's out in search of the perfect pale ale.